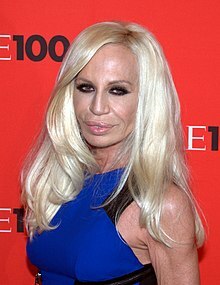 Donatella Francesca Versace (Italian: [donaˈtɛlla franˈtʃeska verˈsaːtʃe]; born 2 May 1955) is an Italian fashion designer and current vice president of the Versace Group, as well as its chief designer. During the 1980s, Donatella's brother, Gianni Versace, launched a perfume dedicated to her, Blonde, and gave her her own fragrance label, Versus, which Gianni formerly ran for her. After Gianni's death, Donatella took over all aspects of the label. Lady Gaga is the present and the future. She is the most revolutionary and inspirational artist. She is fearless and daring. A business woman needs a successful mix of design and practicality. It's no good being too easily swayed by people's opinions. You have to believe in yourself. People are always surprised when they spend time with my children by how normal they are. They're polite. They're well mannered. They're very down to earth, in a way. I love anyone who breaks the rules, and musicians always break the rules - in an aggressive way. Scent is very important. Strong fragrances suit some men, while citrus types suit others. I like my men to smell fresh and woody, but also like a man. I wake up at about the same time every day. I sleep well and wake without an alarm clock. Die and born again, die and born again. It's the story of my life. How do I keep young? Haven't you heard? I sleep every night in the deep freezer! Powerful women intimidate men. If she's a really well-known woman, she has a career, she's famous - in that case, men are really afraid. I was a fashion addict by the time I was 11 years old. I'd wear a miniskirt and patent-leather boots. At that time of the supermodels, celebrities didn't want to be in fashion; they thought they were more intellectual and interesting than anyone in fashion.